Koh Samui is an island in Thailand well known for its luxurious resorts, coconut grooves and its palm-fringed beaches, and it is an ideal destination for marriage and honeymoon in Thailand. Each of its beaches has something different to offer every visitor, from a buzzing party atmosphere to a serene, relaxed ambience. Koh Samui is one of the most romantic wedding destinations in the world. It has all the assets of an exceptional place to host a wedding event. Koh Samui is easy to get to. Its location is halfway between Europe and Australia, making it a convenient location for an ideal wedding destination. Koh Samui has easy access to all the Asian Hubs. With several flights a day arriving from Bangkok, Singapore, Phuket and Pattaya, wedding guests would have no difficulty making their way to the island. For those who prefer to get there by water transportation, ferries run from mainland Thailand several times every day. The warm tropical weather, the nodding palm trees surrounding the resorts and the fine white sand beaches give Koh Samui a distinctive atmosphere for a perfect marriage in Thailand. Good planning is at the heart of every successful wedding event. If you wish to save yourself a lot of stress, you may consider engaging an independent wedding planner. This will help clear up many issues straight away, but you need to speak to contenders on the phone before making a decision, especially if you are planning from far away. It will also be helpful to compare online reviews and check references (if available) before committing to an outside planning company, as this can save you a lot of headache later on. The first step is to pick a suitable venue, as this will have an impact on your costs. Samui beach weddings are gorgeous and picturesque, but the beaches are public domain, so most Samui island weddings taking place at the beach will not be private. This is an important thing to consider if privacy matters. 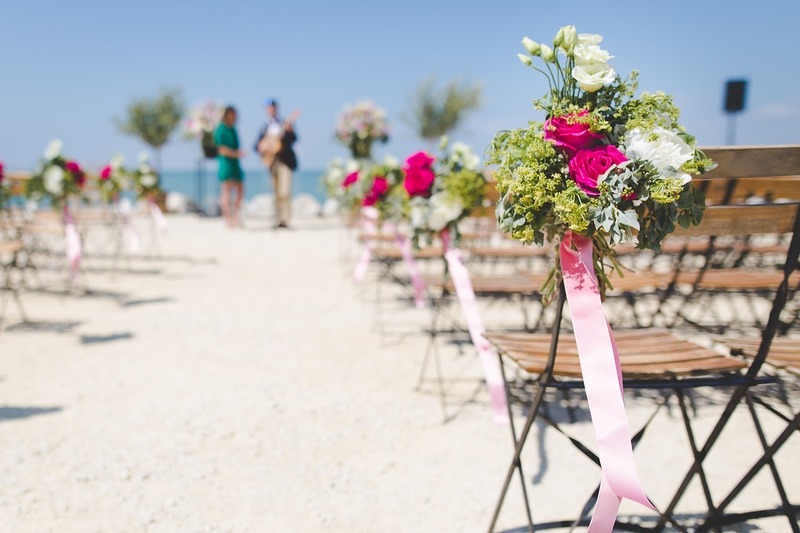 Beach wedding packages are less expensive than resort weddings. Villa weddings can be arranged anywhere in Koh Samui and some can accommodate a large number of guests. Unlike beach weddings, intrusion is not an issue and if privacy is really important, you can head off the beaches into the hills where there are no passers-by. If you are having a small wedding, it makes great sense to rent a villa as many of them don’t charge extra event fees. Koh Samui resort weddings are quite popular and they offer a greater price range when compared to villa weddings. They offer a team of English speaking wedding coordinators so you don’t have to hire an independent wedding planner. They may also include wedding goodies in their package and this may include free hotel nights, wedding cakes, flowers or champagne. Unlike villa, you may only be able to book part of the available guest rooms. If you want a low key wedding ceremony without all the fancy, there are dozens of beach restaurants and bungalows, but their staff may not be quite as fluent in English Language. You may also need to do a little more work doing the venue hunting, so it may be advisable to arrive in Koh Samui in advance of your wedding. How about a wedding in exotic locations such as in a yacht or a large speed boat? All these are possible if you are willing to put up with the extra costs. There are various wedding packages to suit every couple’s pocket. You can expect a standard wedding package to include the use of the venue, set-up and decoration. There will also be accommodation for one or more nights and round-trip airport transfer for the bride and the groom. Also included in the budget would be cake, photography, flowers and makeup for the bride. Extras such as spa treatment may be included on request. The cost of getting married in Koh Samui depends on the mix of choices you make. In computing the budget, due consideration must be given to dinner/ reception costs, taxes and service charges in addition to the wedding package prices. The size of the budget will be influenced by the chosen venue (beach wedding packages are less expensive), the guest size and the price of the wedding package selected.